Requirements: 486 DX, 66 Mhz, 8 MB RAM, A Local Bus Video display card. History: Way back in the beginning of time you could plug in your cartridge on the Atari computers or boot a disk on the Amigas, Apples, and new IBMs and play a real arcade game. This is what Death Rally is, top-down-arcade racing. Plot: You start out from the bottom of the ranking list. Your objective: earn money in the blitzkrieg-battle races, and fight hard for each precious championship point. Each race can be lethal, and while taking the curves as hard as you can, your fellow competitors are showering you in a constant hail of bullets. While the losers repair their cars and cover those bullet holes, the winner spends his hard earned money on new engines, tires or stronger armor. Company line: Enter the corrupt racing world of Death Rally, where defensive driving means annihilating your opponents. You'll become ravenous for the power and the glory that comes with being the best at Death Rally, but first you must pay your dues. Put the pedal to the metal and smash, blast and obliterate the competition to earn the chance to face the undefeated master, "The Adversary." Make deals with loan sharks and mob bosses to get the cash you need to build the ultimate battle racing machine. Remember, no trick is too dirty, no spectator too innocent, in your savage quest for the checkered flag. 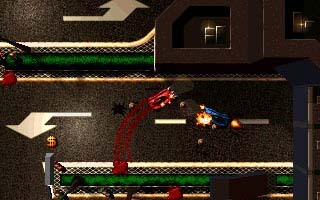 Game play: Shoot your way through screaming bystanders, pick up more ammo and turbo from the side of the track, and floor the pedal while performing some shady deals for The Dealer. No trick is too dirty when you're preparing for The Final Confrontation; only the hardest armor, the most powerful engine and the biggest guns will see you through the ultimate battle against The Adversary. And when you feel you can't take it anymore, you can check out the underground market: Spiked bumpers, landmines, rocket fuel or sabotage can provide a way to create some nasty accidents to the competition. Each car is equipped with different weapons, upgradeable Engines, Tires and Armor. Interface: The controls are easy to use and the game pad is even better. Cars you drive: 6 different cars which you can modify with the money you win to really bash the competition next time. Graphics: Utilizing a hi-performance 3D-Engine with texture mapping, lighting effects and shadows, Death Rally creates a level of visual impact never seen before in the racing game genre. 100% rendered cars, animated hi-resolution menu system and a great playability make sure that you've never had this much fun before. There is no Super VGA mode. The VGA graphics work with the game but SVGA would have been so much nicer. Overhead perspective of primitive grainy graphics does not impress. Animation: Over 20 megs of action packed animation. Often the animated scenes jerk and skip interferring slightly with game play. Cheats, Hints and Tips: Click here for Death Rally Cheats. 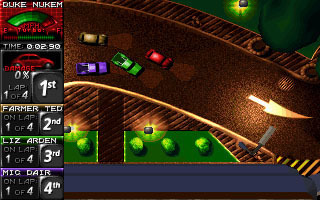 Multiplayer: Play alone or with friends, Death Rally supports network multiplaying for up to 4 players (registered version) and serial or modem connection for two players. Kevin J. McCann, Computer & Net Player, volume 3, number 10, March, 1997, pg. 83, 80%. Corey Cohen, PC Games, volume 4, number 3, March, 1997, pg. 64, 88%.